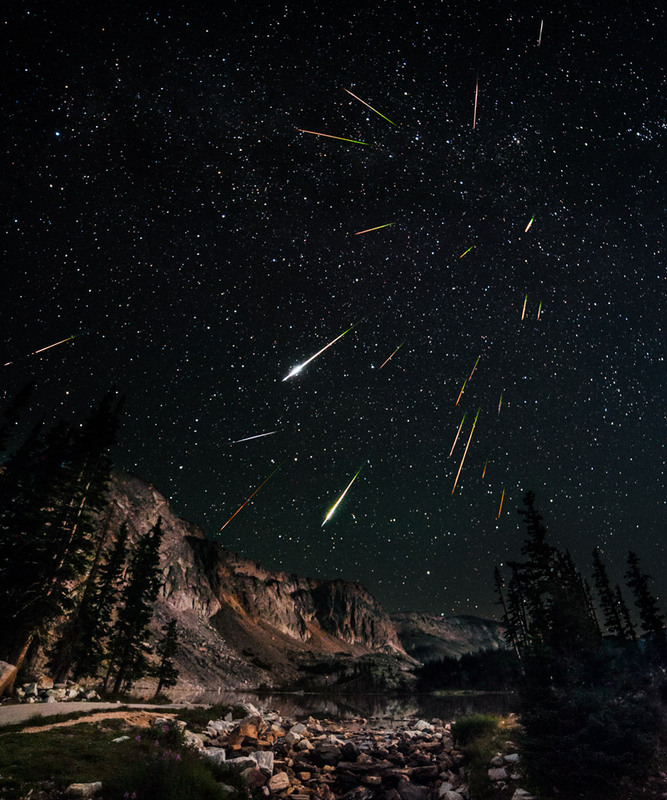 A Boost for the Perseid Meteor Shower in 2016? The Perseid meteor shower, the most reliably active meteor shower of the year, peaks on the night of August 11-12, 2016. A summer favorite of northern stargazers, yet still visible in part in the southern hemisphere, this meteor shower sprays some 50-60 per hour, on average, across the sky. This year the waxing gibbous Moon obscures the view of meteors before midnight, but it sets shortly thereafter and leaves a dark sky during the predicted peak of the shower. And some astronomers are predicting the gravitational influence of Jupiter will make for many more Perseid meteors in 2016 than usual, perhaps as many as 100-200 per hour! With that brave comment, Laurentius, now called St. Lawrence, became the patron saint of comedians. But the date he died, August 10, was also known throughout the world for an annual display of meteors or “shooting stars”. Like most meteor showers, the Perseids are simply dust-sized pieces of icy debris expelled from a comet, in this case, Comet Swift-Tuttle. As the Earth passes through the comet’s debris trail once each year, some particles streak through our atmosphere and heat up, leaving a transient bright glow we call a meteor. The tiny particles burn up in the atmosphere. Very few, if any, make it to the Earth’s surface. Some hit the moon, too, though they’re too faint to see, even with a telescope. While the meteors move into the Earth’s atmosphere on parallel paths, they appear to radiate from a single point in the sky called a radiant. The effect is similar to falling snowflakes that seem to radiate from a point in front of your windshield as you drive into a snowstorm. The radiant of the Perseid meteors is found in the northern constellation Perseus close to its neighboring constellation Cassoipeia. The Perseids build slowly, starting in late July when you might see 3 to 4 an hour. They peak when Earth passes through the thickest part of the debris stream on August 11-12. At the peak of the show, in clear, dark sky, you might see as many as 60 meteors an hour. This year, in 2016, the Earth may run into an extra-thick clump of debris created by Jupiter as it passed near and compressed the cometary stream. Observations suggest the Perseids display a marked increase in meteor numbers every 12 years, an interval which corresponds to Jupiter’s orbital period around the Sun. Such peaks have been observed in 1968, 1980, 1992, and 2004. The peak in 1980 was particularly spectacular, with some observers reporting as many as five to six meteors per minute at the peak. For the best view of the Perseids, look for meteors late on August 11 and the early morning of August 12. After midnight is best… that’s when the Earth turns into the stream of particles from Swift-Tuttle. Avoid ambient light if you can. Lie on a reclining chair or a blanket on the ground, and simply look up. You don’t need binoculars or a telescope. Nor do you need to look right at Perseus: the meteors can appear anywhere in the sky. Those with long streaks come into the atmosphere at an oblique angle. Those with shorter streaks enter the atmosphere at a steep angle and come more directly towards you… and no, they will not hit you! Because the radiant lies in Perseus, northern-hemisphere observers get the best view, although southerners will see some, too.